If you want to foster those creative, problem solving skills, the solution isn?t learning to code ? it?s learning to paint. Or play an instrument. Or write poetry. Or sculpt. 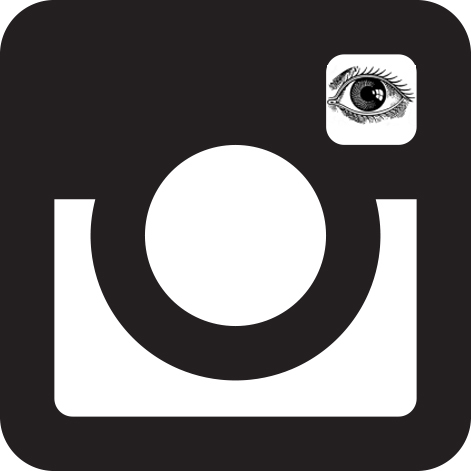 The field doesn?t matter: the key thing is that if you want to foster your own innovative creativity, the best way to do it is to seriously pursue an artistic endeavor. In the history of the Nobel Prize, nearly every Laureate has pursued the arts. According to research by psychologists Michele and Robert Root-Bernstein, ?almost all Nobel laureates in the sciences actively engage in arts as adults. They are twenty-five times as likely as the average scientist to sing, dance, or act; seventeen times as likely to be a visual artist; twelve times more likely to write poetry and literature; eight times more likely to do woodworking or some other craft; four times as likely to be a musician; and twice as likely to be a photographer.? Perhaps?you don?t need to learn to code. For a testament to the Nobel observation, see?Richard Feynman?s sketches and drawings. 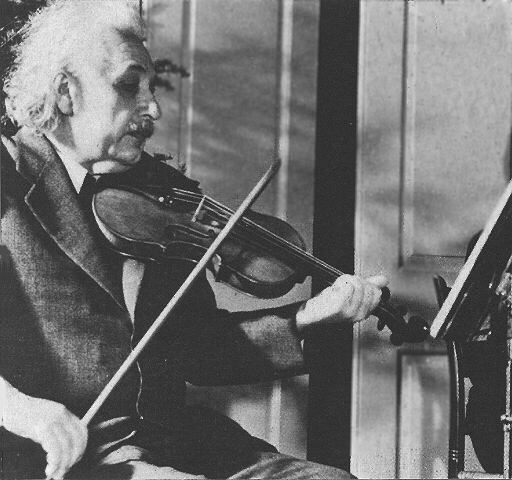 We also know that Einstein worked out some of his most difficult physics problems?while playing violin. “I received a call from a colleague about a student. He felt he had to give him a 0/20 to a physics question, while the student claimed a 20/20. Professor and student came to an agreement to select an impartial arbiter, and I was selected. “1001 Inventions” The Enduring Legacy of Muslim Civilisation from Shahidul Alam on Vimeo. Nobody in our family studied or took up religion. I only knew from the nanny, who took care of us, that there was a God, whom she, according to her words, feared and respected. On several occasions, unknown to my parents, she even took me to a church. When my father found out, he, to much to nanny’s surprise, did not get angry. Upon finding from me that I liked church, and from the nanny that I did not disturb anyone there, he decided that in the future we could go to church whenever we wanted. I remember well how proud I was when we walked openly to church, wearing our best bonnets. Later the nanny told me that every girl should know a prayer, and I learned one from her by ear, without understanding a single word. To all my questions she always answered: “I am illiterate, when you get educated you will understand everything”. But I did not want to wait until I grew up and was educated, and so I went to my father to clear things up. He seemed to be surprised when I recited the prayer from memory, and asked where I learned it. He did not express any feelings towards the whole matter, but simply explained that the prayer thanked the Virgin Mary for giving birth to the Lord Jesus Christ. This however did not yet mean anything to me, and I went about my business as before. One day Leonid, my older cousin, who lived with us, did something that was strictly forbidden. The nanny then warned him to never do it again or “God will punish you”. To this the boy quickly replied: “God does not exist”. The nanny was horrified, and began to tell him how you can’t say things like that. Leonid was unimpressed and stubbornly stuck by his comment. Meanwhile I was completely confused by the whole matter and had no idea where the truth lay. I began to get upset and to get a straight answer I went to my father, as I always did in difficult situations. I remember well how he was sitting at the table working. I could not hold back the worrying question, and so I came up close, so he would notice me, a favorite tactic of mine. He put down the pen, turned and hugged me by the shoulders, asking what happened. “Dad, is there a God?” – I burst out. “Why do you ask me?” – he replied. I told him of the “discussion” between the nanny and Leonid. He suddenly become very serious. “You see,” – he said, “some people, like our nanny, believe that God exists while others reject the idea. Everyone must decide this for themselves, when you grow up you too will decide”. He never forced his opinions on us, unless of course we were doing something really wrong. In most cases he preferred for us to work things out on our own. Often when we asked a question, he did not give a complete answer but rather drew us into discussions that resulted in a commonly agreed on answer or decision. A few years before his death, my father began to smoke. No one was really bothered by this as he did not smoke often, and it seemed to make him happy. I liked to watch him as he smoked, he had a special sort of smile at these times. One day Leonid told me how unfair he thought it was that we weren’t allowed to smoke. He said he tried it himself but only succeeded in burning his eyebrow, therefore we should do it together. He even found a perfect place: between bookshelves, and suggested we go and try it immediately. But I was not used to doing things secretly, and I was always sure of my father’s understanding and support in this. I asked Leonid to wait until the night, when he came home. Leonid agreed, but only until the night. I impatiently waited my father came home and, barely letting him take his coat off, came up to him under pretense of injustice: “You smoke, but don’t let us!” He paused for a moment and asked: “Have you tried already?” I said no, but that Leonid had. Father said: “You are right, we’ll smoke together tonight, just wait until I finish dinner”. He went to eat in my grandmother’s room, where by now the whole family gathered, and I ran with the shocking news to Leonid. When the two of us burst into the room, my father was drinking tea, while everyone else was sitting by the table or stove, discussing, as usual, the days events. Me and Leonid sat down on either side of Lev Semenovich, and began to wait. He soon finished his tea, and took out the cigarettes giving one to me and one to Leonid. Suddenly everyone in the room went quiet and began to watch us intensely. He was in no hurry, packing the cigarettes, all the while showing how its done and why its necessary. He then demonstrated how to hold the cigarette in the hand and in the mouth. Finally he lit his, took a drag and brought the lighter to ours. Everyone around us was watching his actions, but not interfere with what was going on. “And now, take a deep breath” – said father. I don’t remember much of what happened then, as I almost passed out and got sick. I think Leonid experienced the same reaction. I guess I should add that I never tried smoking again, and Leonid did not try again until he was over 18. There is one more thing that happened that I will recount. It’s still unpleasant to talk about it, but it happened and it taught me a lesson for life. By now I was in school. I remember it was late May. In class we had an important final coming up. I had a very serious attitude toward it, and was rather anxious. It so happened that I did well on the exam and got a high mark. I returned home in high spirit and was doubly over joyed: my father was home! When he asked me what was new in school, I proudly told him of my success, and added with ill-concealed pleasure that the girl sitting next to me could not copy from me as I had turned the page of the notebook, and because of this got a poorer grade than me. I was beaming and expecting praise, looked at father. I was surprised at the expression on his face: he looked very disappointed. I could not understand what was wrong. May be he did not realize I passed? After a short silence he began to speak, slowly and deliberately so I would remember everything he said. He told me that it was not nice to be happy of others misfortunes, that only selfish people enjoyed it. He went on saying that I should always try to help those who need it, and its only for those who help others that the life is rewarding and brings true joy. I remember I was very upset from his words and asked what I should do now. As always in these situations he offered me a solution: he did not want me to feel like once I did something wrong I was now incapable of doing good. He suggested to me that I go and ask my classmate about what she didn’t understand, and try to patiently explain it to her, and if I couldn’t do it so she would understand perfectly, then he would be glad to help me. “But here is the most important thing”, he added, “you must do all this so your friend be sure you really want to help her, and really mean her well, and so it would not be unpleasant for her to accept your help”. More than 60 years have passed since this incident and I still remember all of his words and try to follow them as best I can in life. I don’t believe that “after death there is nothing else”. After his death, the person continues his life in memories of those who loved him and in his works. And so Lev S. Vygotsky lives in the memories of those few, still alive, who know him, and most of all, in his writings that, thanks God, are finally available to everyone. As far as his students go…, well, many of them became famous scientists. Luckily, many were granted a long life. But despite their graying heads and elevated scientific status each has reached, they all still consider the 37 year old researcher their teacher. This was something they never got tired of talking about, and always with great love. Now many are gone, but their students, and now even their students’ students go on. And so science develops. Even though so many years have passed, Vygotsky’s thoughts, ideas, and works not only belong to history, but they still interest people. In one of his articles, A. Leontiev wrote of Vygotsky as a man decades ahead of his time. Probably that is why that he is for us not a historic figure but a living contemporary. `Owning’ the weather? You must be thinking, What a preposterous idea! Apparently not, for those who wrote the report from which I’ve quoted above (August 1996). It was a study commissioned by the chief of staff of the US Air Force to examine the “concepts, capabilities, and technologies the United States will require to remain the dominant air and space force in the future.” One which was reviewed by security and policy review authorities, and cleared for public release. As I read the report, I cannot help but wonder at what is contained in those documents which have not been revealed to the public, ones that are classified. Neither can I help but marvel at the devotion and hard work that has gone into imagining, drawing-up and detailing such a scheme of mass murder. At the colossal criminality involved. An issue that the authors hurriedly traverse?”[weather-modification techniques] offers a dilemma,” it is a “controversial issue,” “some segments of society” are reluctant?lest they have any second thoughts, lest they develop any moral qualms over the matter. Of course, as is only to be expected, all the necessary disclaimers are there. The views expressed are those of the authors. They do not reflect the official policy or position of the US Air Force. Or, the Department of Defense. Least of all, the US government. Representations of future scenarios are fictional. Any similarity to real people, to real events, why, to reality itself?is unintentional. 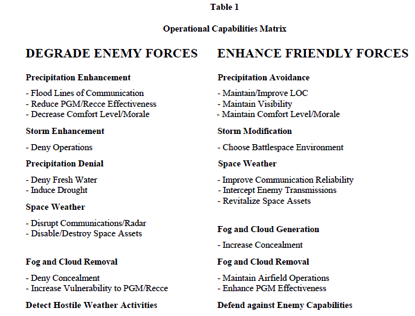 Weather modification, write the authors, has “tremendous military capabilities” (see table). Rainfall can be enhanced to flood the enemy’s lines of communication. To reduce the effectivity of precision guided missiles (PGM). Rainfall can be prevented too. To deny the enemy access to fresh water. To induce drought and wreck food cultivation. Fogs and clouds can be generated, or removed. Friendly forces merit generation, to enhance their ability to conceal themselves. While enemy forces shall suffer from fog/cloud removal, to deny concealment. To smoke ’em out? To develop an integrated weather-modification system, technological advancements are necessary in five areas: (1) advanced nonlinear modeling techniques (2) computational capability (3) information gathering and transmission (4) a global sensor array, and (5) weather intervention techniques. Some of these “intervention tools” already exist, we are told. Others may be developed. May be refined. For future use. To develop and refine technologies of mass murder….? Current weather-modification technologies which will mature over the next 30 years, will?in all likelihood?become “a part of national security policy with both domestic and international applications.” A policy that could be pursued at “various levels”: NATO. 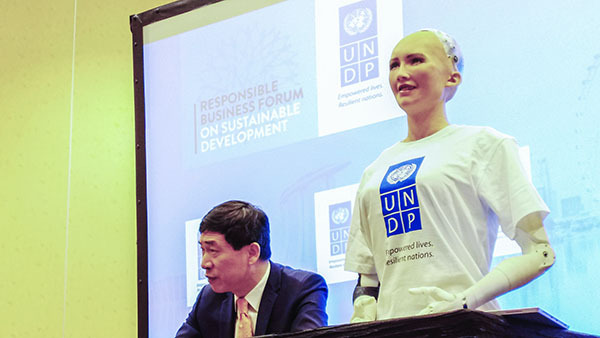 UN. Coalition. And, if the national security strategy in 2025 includes weather-modification, “its use in our national military strategy will naturally follow.” Its benefit? It’ll “deter and counter potential adversaries.” It’s “appropriate application… can provide battlespace dominance to a degree never before imagined.” The executive summary ends on this ominous note: ?The technology is?there, waiting for us to pull it all together;? in 2025 we can ?Own the Weather.? The current military and civilian worldwide weather data network will evolve and expand to become a Global Weather Network (GWN). One which will be a super high-speed, expanded bandwidth, communication network by 2025. By then, weather-prediction models will prove to be “highly accurate in stringent measurement trials against empirical data.” And the “brains” of these models? 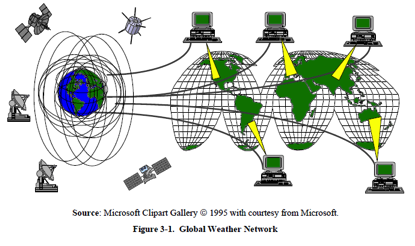 “Advanced software and hardware capabilities which can rapidly ingest trillions of environmental data points, merge them into usable data bases, process the data through the weather prediction models, and disseminate the weather information over the GWN in near-real-time” (see Figure). Although “extreme and controversial” examples of weather modification, such as, the creation of made-to-order weather, large-scale climate modification, creation and/or control (or ?steering?) of severe storms, etc. were researched, “technical obstacles preventing their application appear insurmountable within 30 years.” And therefore, the authors write, these are only mentioned briefly. Close observers are inclined to disagree. Weather warfare, they think, has already started. “What are the underlying causes of extreme weather instability, which has ravaged every major region of the World in the course of the last few years?” writes professor Michel Chossudovsky, one of the keenest analysts. While global warming is undoubtedly an important factor, writes Chossudovsky, it does not fully account for these extreme and unusual weather patterns. In the 5 years since he wrote “The Ultimate Weapon of Mass Destruction: “Owning the Weather” for Military Use” (Global Research, September 2004), many more natural disasters have occurred: the Asian tsunami which hit 14 countries; Indonesia, Sri Lanka, India and Thailand most severly, killing nearly 230,000 (December 2004). Hurricane Katrina in New Orleans, Louisiana, 1,836 people lost their lives (August 2005). Great Sichuan earthquake in China, 68,000 died (May 2008). The recent earthquake in Haiti, 200,000 estimated dead (January 2010). In a 1997 article of The Wall Street Journal (Nov 13), Chen May Yee wrote about a memorandum of understanding to be signed soon between a Russian and a Malaysian company to create a hurricane that would create torrential rains, one that would be directed close enough to clear the smoke without actually coming on land to create a devastation. In an earlier piece The Wall Street Journal had reported that a Russian company, Elate Intelligent Technologies Inc., advertising under the slogan `Weather Made to Order’?sold weather control equipment. Elate is capable of fine tuning weather patterns over a 200 square mile area, for as little as $200 per day. Hurricane Andrew, which had occurred a year earlier and had caused damage worth $30 billion could have been turned into “a wimpy little squall,” according to Igor Pirogoff, a director of Elate. Doesn’t this mean that hurricane Katrina too, could have been diverted? As I research on the internet, I come across another news item: “Entering a thunderstorm 10 miles off West Palm Beach, a B-57 Canberra jet bomber chartered for one million dollars releases some 9,000 pounds of improved Dyn-O-Gel capable of 10-times stronger water absorption. Miami’s Channel 5’s weather radar shows the huge thunderhead losing moisture. Within seconds, the buildup vanished as one side of the cloud collapsed ?like an avalanche?, according to a chase plane cameraman.” (Sun-Sentinel July 20/01). As a weapon of war, the use of weather modification techniques was publicly described much earlier. On 20 March 1974, by the Pentagon. A 7 year cloud seeding effort in Vietnam and Cambodia, costing $21.6 million, had been initiated to increase rainfall in target areas, thereby “causing landslides and making unpaved roads muddy, hindering the movement of supplies.” ?That US forces had suffered a drastic defeat in Vietnam, and forced to leave in 1975, is now part of history. At present, other countries, probably China and North Korea, are feverishly working to catch up. Early snow covered Beijing last November. According to the Chinese state media, it was the result of Chinese metereologists’ efforts to “make rain by injecting special chemicals into clouds,” a technique that often gets results (Agence France-Presse, 1 November 2009). The 25th March is a significant day in Bangladesh. It was this day, in 1971, when the Pakistani army began its genocide, causing the death of millions, but eventually also leading to the birth of the nation. The Pakistani army had been supported by the United States, who had sent the seventh fleet to the Bay of Bengal in a show of strength, pitting its might against India and its ally of that time, the Soviet Union. The United States also influenced Bangladesh in a very different way. Exactly 57 years earlier to the day, a man born in Iowa was to affect the destiny of Bangladeshis in a profound manner. Considering that he was one of only few US citizens to receive the Nobel Peace Prize, he was little known, even in his own nation. Amongst Nobel Prize winners, only? Rev. Martin Luther King Jr., Mother Teresa, Nelson Mandela and Elie Wiesel have also won the US Presidential Medal of Freedom and the Congressional Medal. Norman Borlaug, the man who prevented a billion people from starving seems to have been easily forgotten. 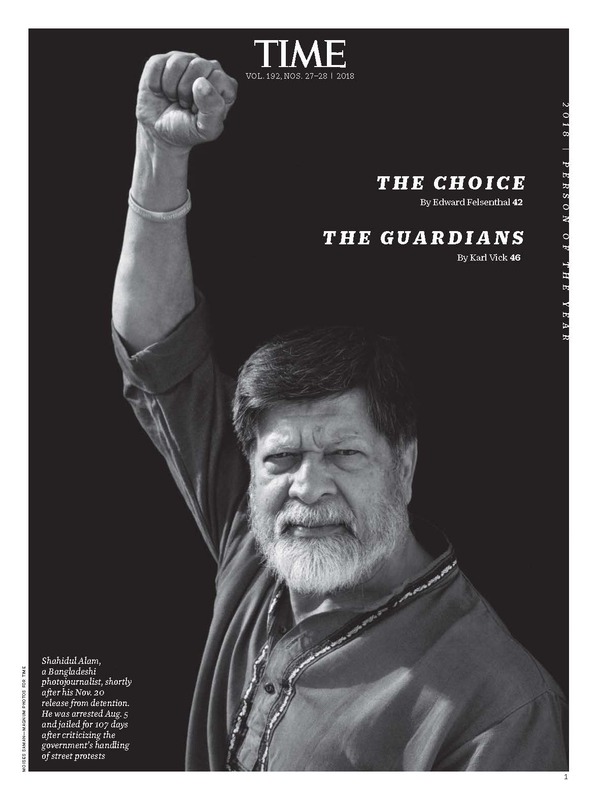 His death on the 12th September 2009, went largely unnoticed in Bangladesh. Interestingly, the man who is said to be the father of the ?Green Revolution? is also blamed by some for having encouraged intensive farming, which some environmentalists feel have led to soil depletion and dependency of farmers. Certainly, a side effect of intensive cultivation is the dependence on both fertilizers and pesticides, effectively a dependence on petrochemical products. While the high yields produced by Borlaug?s techniques are undeniable and revolutionary, the increase in costs of fertilizers and pesticides has resulted in dependence on imports from foreign companies. The rate of increase in rice production in India, for instance, has been far outstripped by the rate of fertilizer intake per ton of rice. Borlaug himself had a simple response to this analysis. There was a need for food, and he provided a way to produce more. He has always said, the real answer was to curb population, but while there were mouths to feed, he made sure there was food to feed them. As a result nations that had been facing a potential famine, Bangladesh, India, Mexico and Pakistan became self sufficient in food. Mexico even became an exporter of wheat. Consequently, Borlaug is credited with having prevented over billion people from starvation. India honoured him with the Padma Vibhushan, its second highest civilian honour. In Bangladesh he received the first honorary membership of the Bangladesh Association for the Advancement of Science. His success in Pakistan, might have been halted by the all to familiar bureaucratic systems we regularly encounter.? When seeds destined for Karachi, reached Los Angeles en-route, a Mexican bank refused to honour Pakistan treasury’s payment of US$100,000, because the check contained three misspelled words. But the seeds did eventually arrive, and eventually led to a doubling of wheat production for both India and Pakistan. While the new technology has undoubtedly also led to increased profits for corporate agribusiness, Borlaug never patented any of his ?inventions? and neither became wealthy nor famous despite the phenomenal transformation he had engineered. Rather, he encouraged its free use, himself working in the fields, training farmers how to maximize their yields. As the initiator of the Nobel Prize had discovered, what technology eventually got used for, depended largely upon who got to use them. Unlike Alfred Nobel, Borlaug, also of Norwegian descent, never accumulated the wealth to find ways to offset the negative effects of his discoveries, but he remained a dreamer till the end. ?When wheat is ripening properly, when the wind is blowing across the field, you can hear the beards of the wheat rubbing together. They sound like the pine needles in a forest. It is a sweet, whispering music that once you hear, you never forget. ?